The message for this week can be accessed here. 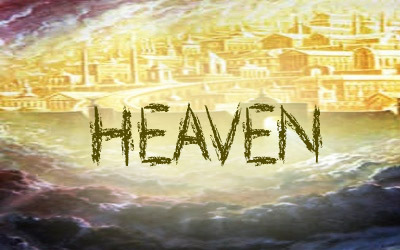 Heaven is a much debated aspect of Christian faith. We’re told Jesus spoke of it in a number of ways, but nowhere do we get answers that satisfy our curious little minds. Thankfully, for once I don’t think it matters that we haven’t a clue, or that we imagine too much, or otherwise are entirely confused about the details of heaven. Why? Because God will take care of it entirely without our assistance. Is heaven real? There have been lots of stories that I find quite compelling, from the area of near death experiences (there are also many I don’t find compelling at all). Some of these experiences have verifiable details before moving on to other experiences that cannot be verified. In 2010 there was a book published called “Heaven Is For Real” which documents the report of the near-death experience of three-year-old Colton Burpo. This is one example of a compelling story. It is arguable that the Bible is a bit ambiguous and “heaven”, using various names and giving various conflicting descriptions. This variety isn’t surprising given that it is describing something that can’t be described accurately in natural terms. Personally, I believe heaven is for real. I have found that some people want to try and say too much about heaven. I prefer to say that God will take care of it, regardless of my thoughts on the subject. God will be there, and even that is unlikely to be as I imagine. But I do expect it will be greater than anything I can imagine from here inside time and space. And it will come in its own good time. Until then, I can spend this life living towards God knowing it will all be okay. There is a lot of peace in that. Just a note to any of our congregation who want to share this – make sure you share it to your timeline and not back to this group by mistake.